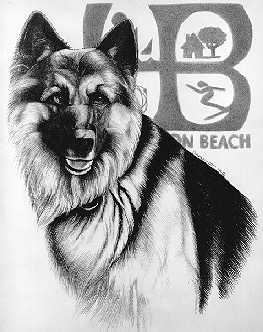 Originating in 1972, the Huntington Beach Police Department's K-9 Unit Program is the oldest program in Orange County. Currently there are two K-9 teams in the K-9 unit which are assigned to Patrol. When not working, the dogs live with their handlers and their families. The K-9 Unit along with their dogs work along with the officers on patrol. The dogs are trained to protect the handler and other officers who are nearby when needed. They are trained to assist an officer even without being called. The dogs are extremely useful when searching buildings, fields, parks, etc. for fleeing or hiding suspects who are often armed. They can be used to track the direction of travel of a fleeing suspect. Upon locating the subject, the K-9 will bark to advise the handler of the find. The dogs offer significant advantages by being more efficient, quicker, and finding subjects without seeing or hearing them. One of the most important purposes of a police dog is to function as a deterrent. During mass demonstrations, the police dog functions as a tremendously effective crowd control deterrent. 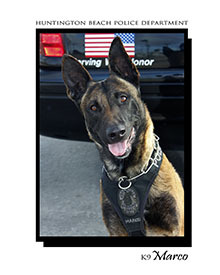 If strategically deployed, one trained K-9 Team is comparable to approximately ten police officers. WHAT KIND OF DOGS ARE USED? 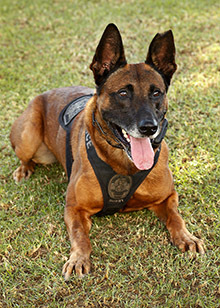 Medium-sized working dogs are best suited for police work. They are strong enough to either stop a fleeing person or otherwise convey an impression of force which guarantees a successful police action. In addition to be able to fight hard to persuade a suspect to surrender, these dogs are extremely agile and faster than any human being. The Huntington Beach Police Department currently uses Belgian Malinois. Officer Wilson was born and raised in Oregon. He served in the United States Marine Corps from 1990 to 1998, before being Honorably Discharged at the rank of Sergeant. 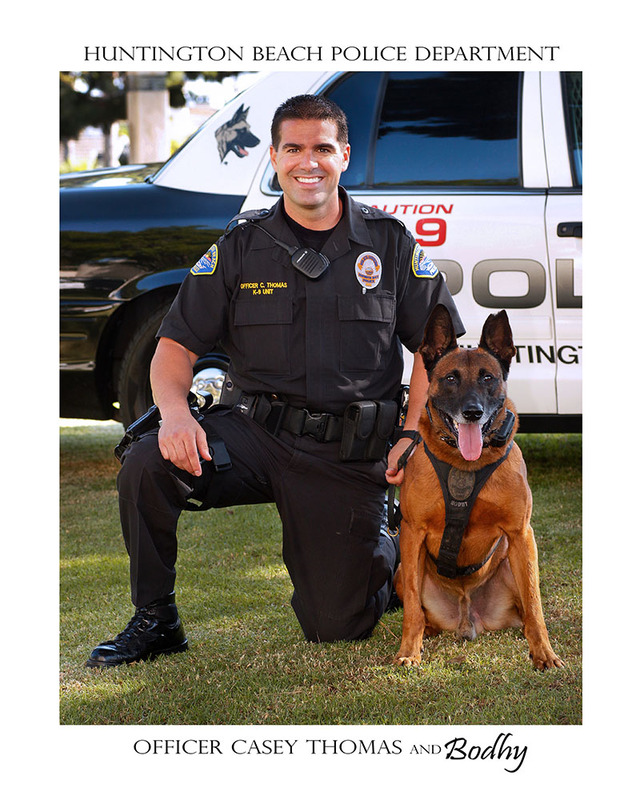 Officer Wilson has worked at the Huntington Beach Police Department since July of 1998. He has been a Field Training Officer for the last 9 years, and been assigned to the K-9 Unit since November 2013. His partner "Marco" is a 4 year old Belgian Malinois, who was born and raised in Holland. Officer Casey Thomas has been a Police Officer for 15 years. He joined the Huntington Beach Police Department in 2008 and was assigned to the K9 Unit in 2012. Officer Thomas's K9 partner is a Belgian Malinois named "Bodhy" who was born and raised in Holland. They proudly serve the citizens of Huntington Beach and neighboring cities when their services are requested. 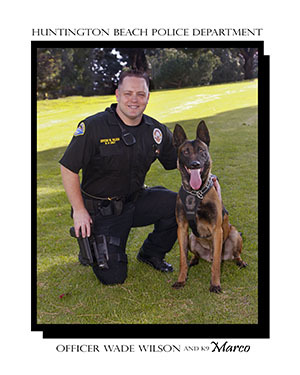 On Sunday, March 26, 1991, shortly after 5:00PM, Officer Jim Weaver and his canine partner were involved in a high speed pursuit into Seal Beach. At the end of the chase, the suspect tried to escape on foot and ignored repeated demands to surrender. KIM was released and chased the suspect overtaking him in a nearby parking lot. Once on the ground, the suspect stabbed KIM several times causing major injuries to the dog. The suspect finally surrendered to officers and was charged with multiple crimes. Due to his extensive injuries, KIM died a short time later. KIM was 5 1/2 years old and served the HBPD for two years. Planning Commission meetings are held on the 2nd and 4th Tuesdays of each month. Meeting Agendas, Action Agendas, and Minutes are available to view online.